For over 20 years, Kaplan Professional has developed a respected reputation by educating and supporting the financial planning and wider financial services industry. We offer the most current version of the courses formerly delivered by the Securities Institute of Australia (SIA), the Financial Services Institute of Australasia (Finsia) and Tribeca. Kaplan Professional is significantly invested in the industry and we’re a recognisable, familiar and trusted face. Kaplan Professional is highly experienced in delivering online education. We’ve been doing this for a long time and know what it takes to help financial advisers succeed. Our vision is to continue to uplift the industry standard by delivering financial planning qualifications that are purpose-built, practical and relevant. We have a deep understanding of the dynamic Australian financial advice environment and embed this insight into our rigorous learning methodology that’s centred on the delivery of performance-focused outcomes. Kaplan Professional’s financial services qualifications are accredited as vocational education or higher education qualifications under the Australian Qualifications Framework and range from certificate IV to masters level. We also offer initial and ongoing continuing professional development (CPD) to meet ASIC RG 146 and RG 206 requirements. Entry-level qualifications for individuals seeking to combine introductory specialist knowledge and financial planning skills in order to prepare for entry into the financial planning industry. Both qualifications will also provide a pathway into the Kaplan Professional Graduate Diploma of Financial Planning. Entry-level qualification combining introductory specialist knowledge and financial planning skills to prepare for entry into the financial planning industry. Builds upon the competencies gained in the FNS50615 Diploma of Financial Planning. Ideal course for individuals wanting to learn a comprehensive range of financial planning services across a variety of product environments, including those involving complex issues, innovative strategies and successful client engagement. Purpose-built qualifications designed and developed in consultation with industry experts that offer contemporary teachings in financial advice strategy and theory. This results in a learning methodology that combines advanced technical rigour with practical and relevant performance-focused outcomes. 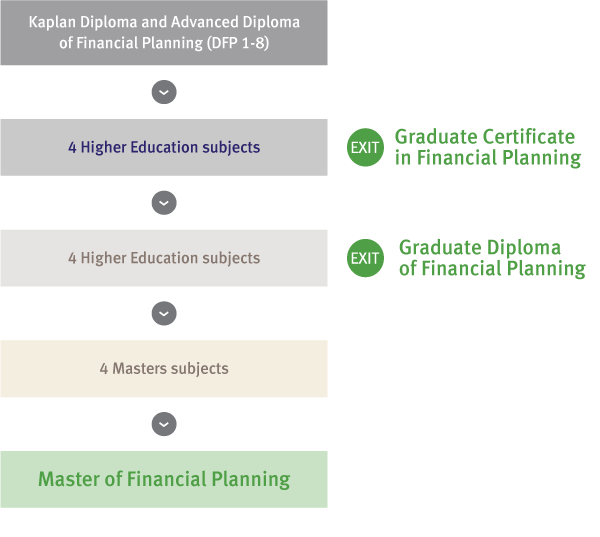 A four-subject postgraduate qualification set at AQF level 8 that provides a stepping stone into the FPEC-accredited Graduate Diploma of Financial Planning as part of the FASEA-approved Master of Financial Planning pathway. An eight-subject postgraduate qualification set at AQF Level 8 and accredited by FPEC. First eight subjects of the FASEA-approved Master of Financial Planning. Purpose-built degree set at AQF level 9, which is FASEA approved. It’s designed and developed in consultation with industry experts, and combines advanced technical rigour with practical and relevant performance-focused learning outcomes. Kaplan Professional has the unique ability to offer pathways from the FNS50615 Diploma of Financial Planning through to our FASEA-approved Master of Financial Planning. We’re committed to providing personalised education pathways to financial advisers who have previous study and work experience to ensure they are gaining the right education to suit their needs. Kaplan Professional is proud of our ability to support every adviser studying at the vocational or postgraduate level by arming them with the tools and resources they need to succeed throughout their education journey. We believe dedicated and focused support is essential in assisting busy advisers who may not have studied for some time, which is why we’ve worked incredibly hard to implement such a comprehensive structure. Benchmark your knowledge against the industry with our adaptive and diagnostic assessment. Gain a competitive edge, stay up to date with industry changes, and meet ongoing compliance obligations. RG 146 will continue to apply to financial advisers who are authorised by their Australian financial services (AFS) licensee as an ‘existing provider’ until the new requirements apply to them. Kaplan Professional offers RG 146 compliance solutions in specialist knowledge areas. Kaplan Professional offers training in a range of specialist areas, including Commercial Law, Tax for Financial Advising. The AFA has proudly partnered with Kaplan Professional as their principal education partner. Click here to learn more about the AFA Professional Pathways.